Despite the name, Skyward Sword isn't just about the blades. You can't have a Legend of Zelda game without the hero packing some serious gear. Link has got some new toys in Skyward Sword, some of which Nintendo is showing off - along with some old favorites - in a new and slightly-too-short trailer. 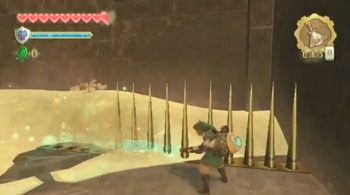 The trailer contains old classics, like the bow and slingshot, as well as new items like the beetle and Link's sand blower contraption. There's also the double clawshot, which interestingly first made its appearance as a treasure in the City in the Sky dungeon in Twilight Princess. Whether that city is what became of Skyloft is hard to tell, but as Twilight Princess is set hundreds of years after Skyward Sword it's certainly not outside the realms of possibility. As the trailer is less than a minute long, I'd have liked to have seen it get to the gear a little bit quicker. It's still an interesting trailer though, made better by the fact there's still more equipment we haven't seen yet. You can watch the full video here.